As another school year comes to a close, we are excited to continue a literacy initiative at Bell Top. Just as nightly reading throughout the school year has taken you on new adventures, summer reading is sure to do the same. 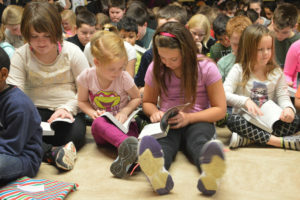 For the past three years, Bell Top students and staff have experienced the joy of becoming a community of readers through a school-wide book club. This is your grade specific summer reading project which will continue our Bell Top Book Club through the lazy, hazy days of summer. This project is due on September 7, 2017. Although each grade level has a specific reading adventure awaiting, a consistent final project will be displayed for all families to enjoy at Bell Top’s Open House. We look forward to hearing about the “adventures” books take you on over the summer.